SOUTH AFRICAN DIAMOND producer De Beers Group has announced it will transport 200 elephants to a nature reserve in Mozambique. The operation, one of the country’s largest ever elephant relocations, is part of a conservation effort to help restore Mozambique’s dwindling elephant population. The company announced the move after the elephant population at the private Venetia Limpopo Nature Reserve got too high, risking extensive damage to the ecosystem. The elephants will be transported about 1,500km from the reserve to Mozambique, which has one of the highest rates of poaching for ivory in the world. 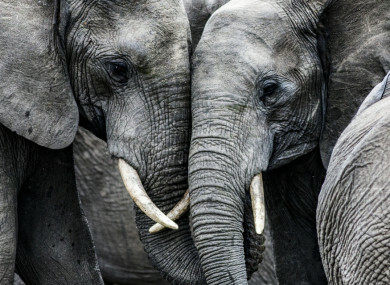 De Beers said it would transport 60 elephants to the Zinave National Park in central Mozambique during July and August, with the remaining 140 elephants to be moved to conservation areas in the country from next year. In a statement, the company revealed that it would also donate $500,000 (€427,496) to anti-poaching group the Peace Parks Foundation over five years. De Beers Group CEO, Bruce Cleaver, said there was “no greater symbol of Africa than the majestic elephant”, and that the company was proud to help the animal flourish in Mozambique. “This translocation is born of a deep sense of responsibility and is part of our wider commitment to continue to invest in new and innovative ways to protect the natural world,” he said. Werner Myburgh, CEO of the Peace Parks Foundation, also welcomed the move, saying it would help the group’s “dream of restoring the landscape” at Zinave National Park. Email “200 elephants to be moved to Mozambique as part of effort to prevent falling numbers”. Feedback on “200 elephants to be moved to Mozambique as part of effort to prevent falling numbers”.